Emily and her mother Debbie Dubois successfully completed our September Heartstart Course last week. Their attendance was as a consequence of the totally unexpected and untimely death of Emily’s brother Harry. Harry, only 17 years old, tragically died in April this year an undiagnosed Heart condition “aortic dissection”. The Dubois Family are now courageously raising money for research into sudden heart defects in the young, entitled “In Memory of Harry Dubois”. A fundraising page has been set up on the British Heart Foundation web-site (http://lastinghope.bhf.org.uk/harryduboisfundraising) and, to date, has raised nearly £30,000! Anyone wishing to contribute to this fund can do so by logging onto this page. A Facebook page (www.facebook.com/InMemoryOfHarryJospthDubois) updates readers with news of fundraising/awareness events. Emily, as part of her desire to keep her brothers memory alive, has also decided to join our Trust as a Heartstart Facilitator and is currently undergoing her training. On the longer term she has expressed an interest in training up to be one of our First Responder Team. 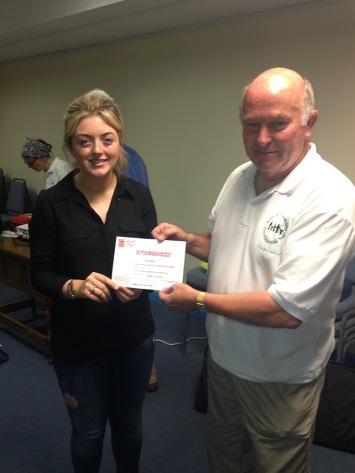 Pictured above is Emily Dubois receiving her BHF accredited Heartstart Certificate from Adrian Rees, Chairman of KCFRT.